Namibia’s far north-western reaches have always held mysteries and marvels. A new mystery has recently emerged, leaving all spectators intrigued – and curious. A s one of the last remaining wilderness areas in Africa, it attracts hard-core travellers and explorers. It appeals to those who have already travelled the main tarmac arteries through the country and the myriad gravel tracks that branch off them like fibrous roots. Kaokoland, as this remote and inhospitable region (now part of the Kunene Region) is known historically, has always been the Wild West of Namibia. And for those self-sufficient and experienced 4×4 travellers who venture further afield, it’s a desert Eden of mysteries and marvels. This pocket of wonders includes the strikingly beautiful Himba people, wizened desert elephants, robust rhinos and elusive desert lions. 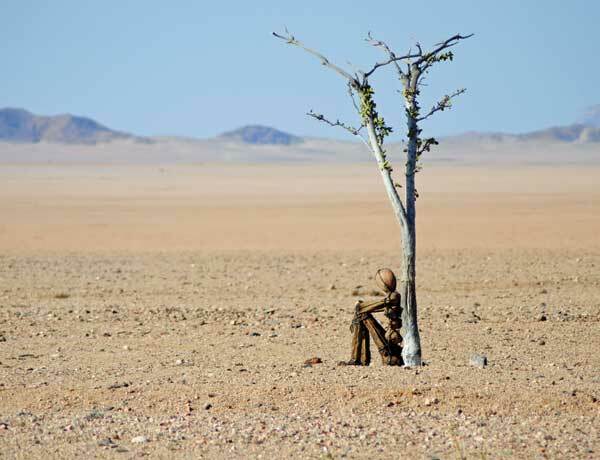 It is home to the remarkable life forms that have developed ingenious survival mechanisms over time to live with a minimal supply of water, like the intriguing and hardy welwitschia (considered a living fossil) and the handsome gemsbok. It also includes extraordinary sights like Epupa Falls where the crocodile-infested Kunene River roars over rugged rocks lined by a bevy of baobabs, the enigmatic fairy circles that look as if they could have been created by aliens, magnetic fields, poisonous euphorbias, termites, fungi – or fairies, the wild expanses of the Marienfluss and Hartmann’s Valley as well as a section of the ancient Namib Desert, the Skeleton Coast, where many a ship came to grief. That’s quite a list, and I could go on… But, a new mystery has recently emerged, one that adds to the atmosphere of this fascinating desert wilderness: the Lone Men of Kaokoland. In the last year there have been more and more sightings of these nearly life-size rock sculptures, created with masterful artistry and a deep sense of place, giving the appearance that they have sprung from the earth. Made from the rock prevailing in the area, they blend in perfectly with their surroundings and take on different poses, catching you by surprise with their lifelike gait or posture. 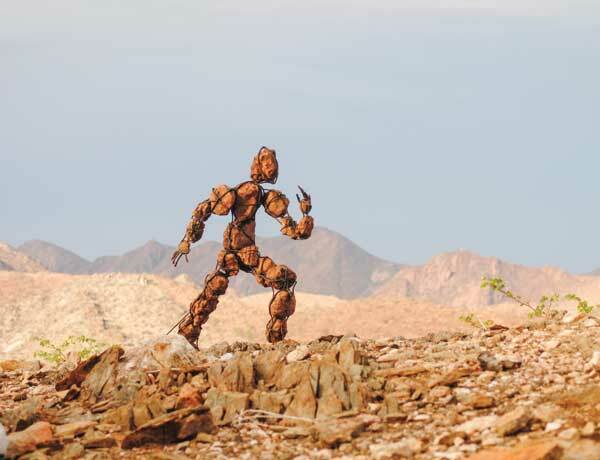 One figure sits on a hill top, surveying the arid landscape, another one – referred to as the Dapper Stapper – strolls across the stony plains carrying a bundle on the end of a stick like an old-time traveller, another appears to be deep in thought, while yet another strides across the rugged land with a strong sense of purpose. Each figure has an aluminium disc attached to it, with a number and a message as to where it is going. Although a sculpture numbered 27 has been seen (and I won’t divulge its whereabouts), only nine Lone Men have been found so far. One person claims to have found another five, but won’t say anything else. 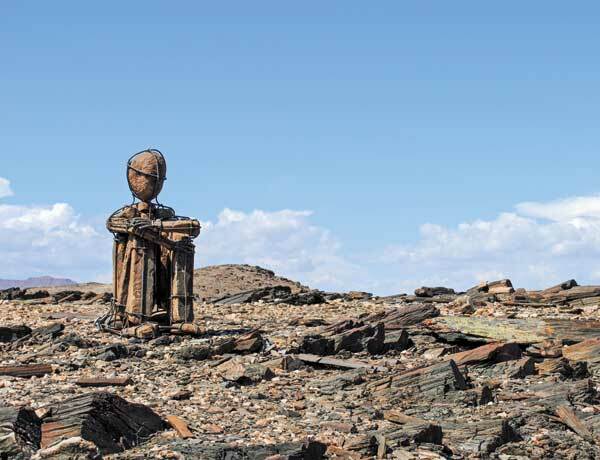 The sculptures have been spotted along the road on the routes between Puros in the south, Van Zyl’s Pass in the east, Otjinungua in the north and the Skeleton Coast Park in the west. Several questions immediately spring to mind: who made these stone figures and why, how many are there and where are the others? But as with any good mystery, no-one knows. Or, if someone does, they aren’t saying. Meanwhile, the Lone Men are gaining cult or celebrity status (well, by Kaokoland standards, that is). For some it’s become an exciting treasure hunt (a bit like geocaching without the GPS, which would obviously spoil all the fun! ), while others want to include them in their trip around western Kaokoland or plan their itinerary around them. I recently overheard a conversation among a group of bikers who are planning a bike ride to visit all the stone men. 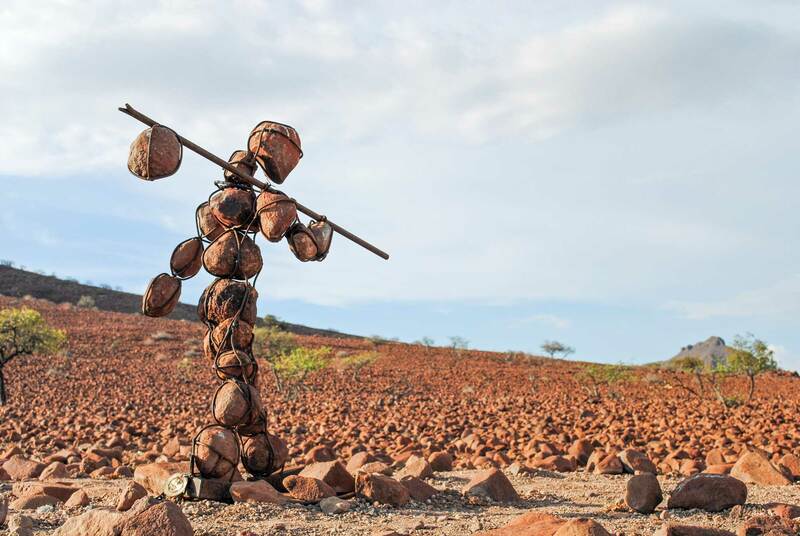 The mysterious Lone Men have also surreptitiously sneaked their way into the list of highlights and ‘must-do’s’ for travellers visiting the Kaokoland and even the top 11 things to do in Namibia, according to 99FM. 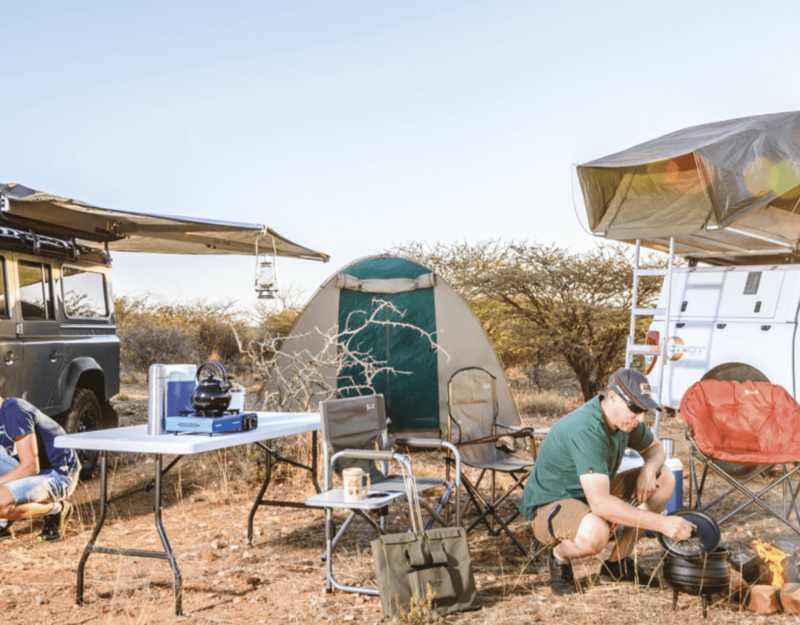 Exploring the country to find the Lone Men has found its way onto their list along with climbing Big Daddy at Sossusvlei and taking a drive through Etosha! OK, the adventure of seeking the Lone Men stands eleventh on the list, but, surprisingly, it is there. People are calling the mysterious Lone Men, Art (with a capital A). A blog article entitled Forgotten Art Fuels Curiosity in an Unforgiving Desert refers to them as pieces of art in an open-air art gallery where the visitor has to alight from his vehicle and enter the gallery to experience them properly. One sculpture, in particular, is gaining appreciative attention in art circles. There is no doubt that the creator of the Lone Men is an artist, and a sensitive one at that. He (or she) has created form and character with scant material, keeping the sculptures natural and authentic. The artist also appears to be environmentally aware and has not littered the landscape with sculptural clutter. The Lone Men are rather unobtrusively dotted through a vast area, simply-made and subtly placed. As far as the locals are concerned, it is said that the Himba are completely unperturbed by the appearance or presence of the stone figures. Several blogs, websites and Facebook pages mention the Lone Men and some ask travellers to send their images, so that all of them can be found in a common effort. Perhaps they will. Or, perhaps they won’t. After all, the delight, intrigue and allure of a good mystery is that it is never solved. Not so? This article was first published in the Travel News Namibia Autumn 2016 issue. Can i buy 1 of the lone men. Dear Delia, unfortunately these mysterious and awesome artworks are not for sale and their maker still wishes to remain anonymous.